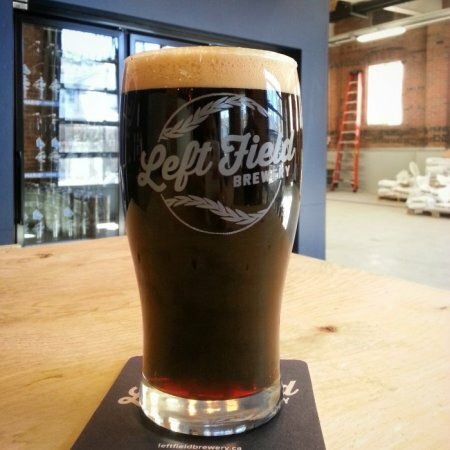 TORONTO, ON – Left Field Brewery has announced the release of a new beer that marks the recent opening their own brewing facility by featuring an ingredient sourced from a neighbouring business. Bricks & Mortar Coffee Porter is a 6% abv and 40 IBU robust porter brewed using coffee from Pilot Coffee Roasters, a roastery and tasting bar located in the same industrial complex as Left Field in Toronto’s east end. There are many different ways to add coffee to a beer. After much discussion, we decided not to add it to the boil so as to avoid extracting some of the potentially undesirable harsh bitterness from the beans. Instead, whole bean coffee was added directly to the tank during cold conditioning for just less than two days. This allowed us to taste the extraction along the way before we decided to pull the beer off of the coffee and begin filtration. The cold extraction worked beautifully with the Kenya Kii and the resulting Porter delivers a complex blend of chocolate, toffee and anise balanced with juicy raspberry, lime, tropical fruit and grape flavours and aromas. Bricks & Mortar Coffee Porter will be available in 750 ml bottles and on tap at the next Left Field Pop-Up Shop, taking place at the brewery (36 Wagstaff Dr., Toronto) this Friday (5:00-9:00 PM) and Saturday (1:00-9:00 PM). It will also show up soon on draught at select craft beer bars in Toronto.